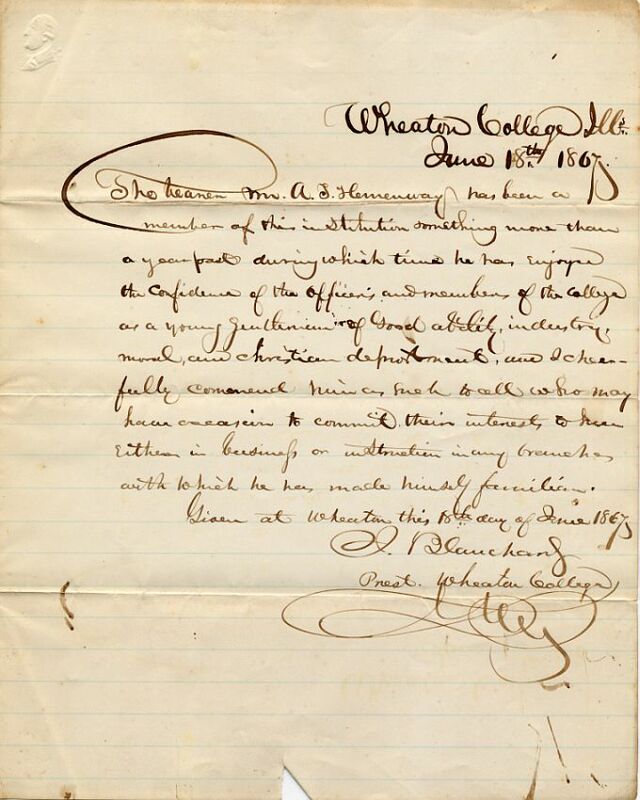 Recently, the Wheaton College Archives and Special Collections obtained a letter penned by Wheaton’s first president, Jonathan Blanchard as a recommendation for alumnus Anson T. Hemingway, grandfather to Ernest Hemingway. The College Archives purchased the letter and photograph of Anson in his later years from a dealer via eBay (a great deal of history goes up for sale on this site daily). The letter makes a strong connection between Jonathan Blanchard and Anson Hemingway, as well as helping establish the context in which Ernest Hemingway grew up. 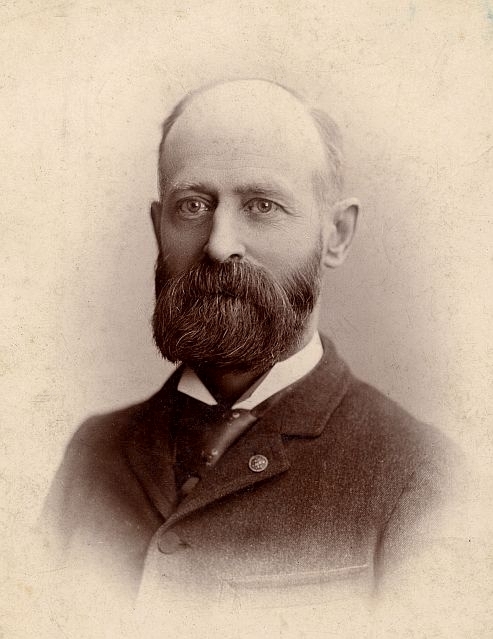 Anson Tyler Hemingway, the son of Allen Hemingway and Harriet Louisa Tyler, was born in East Plymouth, Connecticut in 1844. The family came to Chicago in 1854 and within ten years all three Hemingway brothers had enlisted in the Civil War. Anson served in the Army as a private with the 72nd Illinois Regiment and fought in the deadly Battle of Vicksburg. He later re-enlisted in Company H, US Colored 70th Regiment as 1st Lieutenant and also served as provost martial of the Freedman’s Bureau in Natchez. Anson’s other two brothers died during the war. After his time in the military, Anson attended Wheaton College. After two years of study, as a friend and admirer of Dwight L. Moody, he went on to serve as general secretary of the Chicago YMCA for ten years before establishing a real estate business in Oak Park, Illinois. Anson married fellow Wheaton student Adelaide Edmonds, who graduated in 1867. Together they had four sons and two daughters. An avid outdoorsman, Anson gave his grandson Ernest a special tenth birthday present of a 20-gauge shotgun, believed to have sparked the future author’s lifelong hunting pursuits. Anson Hemingway passed away in 1926 at the age of eighty-two.